Both MedPageToday and Medical Economics covered the latest American College of Physician (ACP) meeting and know how to drive traffic to their site - just mention Maintenance of Certification, Richard Baron, MD, and their pals at the American Board of Internal Medicine (ABIM). 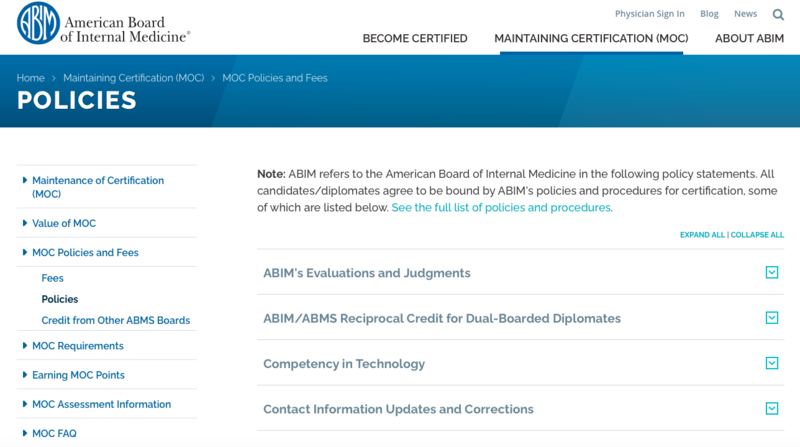 Their pieces suggest the ABIM is trying to keep their corrupt "Maintenance of Certification" program, born from a collaboration between the ABIM and ACP years ago, "meaningful and relevant." "Grandfathering is a really vexing challenge," said Baron. "It's pretty difficult to defend ... I would not see those doctors as equivalent to doctors who rectify." I'd like to thank the editors of both journals. 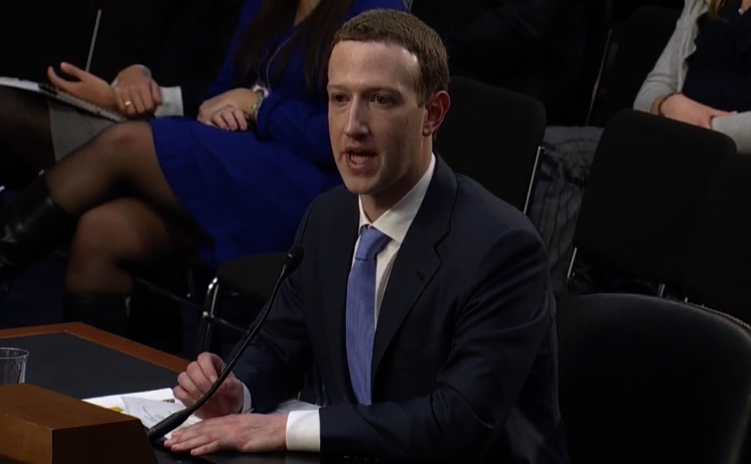 Mr. Mark Zuckerberg, uncomfortably stuttering and stammering before Senator Cantwell about a little-known company named Palantir (aka "Stanford Analytica"), reminded me of a similar moment when Christine Cassel, MD from the American Board of Internal Medicine (ABIM) had to answer questions about her affiliations with Premier, Inc., and Kaiser Foundation Health Plans and Hospitals upon taking the helm at the National Quality Forum. 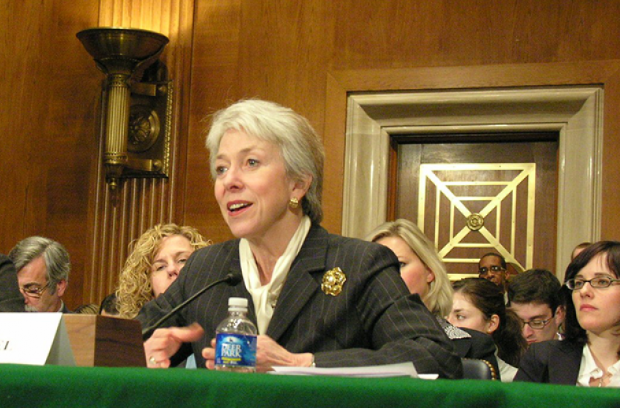 Dr. Cassel brushed off those concerns as "distractions" by resigning from the boards of those corporations, in large part to avoid questions of why those relationships were an issue. Through Premier, client organizations are able to quickly and cost-effectively launch their own sophisticated online initiatives directly to their target audience (e.g. members, employees, associates, applicants/diplomates, etc.) by leveraging Premier’s multi-million dollar investment in world-class applications and enterprise-level infrastructure (SAS 70 Type II). At its core, Premier’s products link performance management (data acquisition via web forms, IVR, external and internal registries, data feeds, etc), assessment, benchmarking, peer comparison, and identification of gaps (financial, knowledge and patient care) with interventions that drive performance improvement. Our platforms align this cycle of performance management and improvement with various incentive programs to drive healthcare provider participation. As a CMS-qualified registry for the Physician Quality Reporting System (MIPS, ePrescribing, MOC-MIPS) and as the service provider for many physician certifying boards (e.g. ABIM, ABO, AOA) Premier is uniquely positioned to align professional and financial incentives with CQI to deliver ‘game-changing’ quality initiatives that have proven and measurable results. This CECity/Premier relationship is firmly embedded in the ABIM's HIPAA Business Associate Addendum agreement every practicing physician must agree to as a condition of enrolling in "Maintenance of Certification (MOC)" (also known as "continuous certification"). With the lack of disclosure of this relationship by the ABIM, is clear that patients and doctors alike aren't supposed to know their personal data are being sold. "For the first time in history, people are sharing information about themselves online in ways that may help determine how to improve their health. As part of its mission to transform cardiovascular care and improve heart health, the American College of Cardiology has been engaged in discussions with Facebook around the use of anonymized Facebook data, coupled with anonymized ACC data, to further scientific research on the ways social media can aid in the prevention and treatment of heart disease—the #1 cause of death in the world. This partnership is in the very early phases as we work on both sides to ensure privacy, transparency and scientific rigor. No data has been shared between any parties." Health systems are notoriously careful about sharing patient health information, in part because of state and federal patient privacy laws that are designed to ensure that people's sensitive medical information doesn't end up in the wrong hands. To address these privacy laws and concerns, Facebook proposed to obscure personally identifiable information, such as names, in the data being shared by both sides. While I appreciate the flowery take of this breach by ACC's spokesperson, I'm afraid the ACC's hand is stuck firmly in the financial data mine cookie jar. After all, as we've seen with Facebook and our recent election, not all uses of data are always in our patients' best health care or financial interest. It's amazing, isn't it? These databases once thought to be a product of ingenuity by for-profit and non-profit organizations, are looking more and more like a product born of little more than opportunity and necessity. But others much smarter than I have known this long ago. To the ABIM, the ACC, and Facebook: it's all just about guns, germs, and steel. There are very bright minds out there, and nothing gets those juices flowing for the dedicated Internet sleuths than when someone is trying to hide a carefully crafted change that benefits the Big Guy and screws the Little Man. 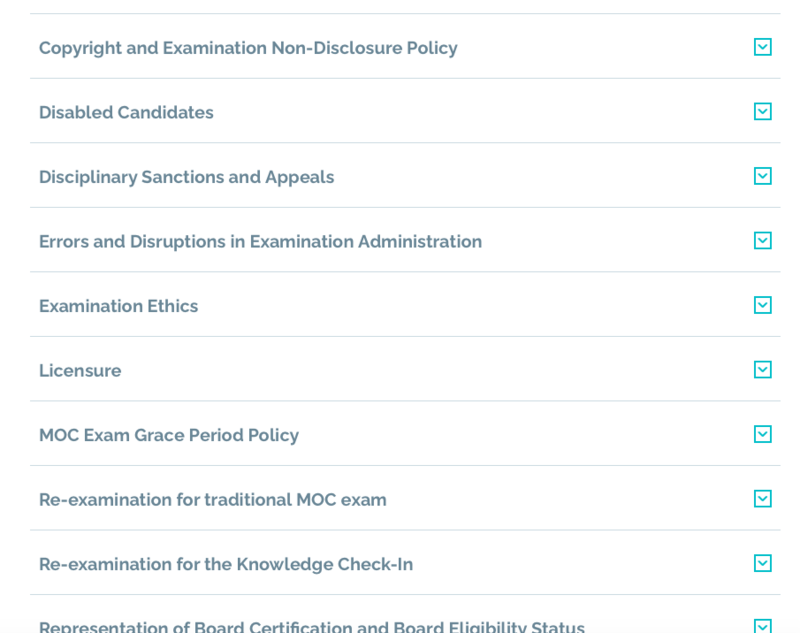 Lately, I've been watching the myriad of changes to the ABIM website. It's got a whole new look and feel, full of big flashy graphics, but little on content. They will argue, no doubt, that it's all made to improve the navigation on their website and to introduce the bold new ideas they have concocted to be sure the fine print is missed. Take a minute and go the the ABIM website. (Warning, you'll need more than just a minute for this contest, but if you've got the time, this might satisfy criteria for some MOC points/CME credit). Click on the Maintenance of Certification banner. Now, this is where things get fun. It will be like The Price Is Right, where Bob Barker asks the contestant to look behind Door Number 1, Door Number 2, or Door Number 3. Go ahead, and click on one of those drop-down arrows of your choosing. What you don't realize, it that behind every one of those arrows, is the hidden surprise that has changed - your MOC® contract with ABIM in all its (hidden) glory. ... which part(s) has(have) changed in the last six months? The provision of medical care is highly regulated. Not all the regulations are to physicians’ liking. Along with our monopoly power, comes controls that are designed to assure the quality of the care we provide. Our education has been regulated, getting licensed has been regulated, and getting certified has been regulated. Now, maintaining that certification has been regulated, too. Dr. Feldman justified MOC because, well, we need more regulation! He seems to imply we should just get over it folks: the unaccountable member boards of the ABMS can do as they please with your money. Buy a condo in the name of "Choosing Wisely?" Sure. Send some funds off-shore to the Cayman Islands for their retirement fund while you do the dirty work of seeing patients? Sure. Buy a nice pond or purchase a nice car collection with your colleagues testing fees? Heck yeah! And why not run a for-profit real estate management firm with certification funds, too? Why of course! Then you can perform research on your colleagues without informed consent! And best of all, you can make sure your pals on the Dermatology board force working physicians into becoming HIPAA Business Associates to CECity (A subsidiary of the $4 billion hospital Group Purchase Organization, Premier, Inc.) when they sign up for their recertification tests? Man, the digital data party never stops giving! If the argument that MOC has not been shown to improve quality, claiming a CME requirement assures quality seems suspect at best. What would a serious solution look like? It would have quantitative, representative measures. Perhaps, it could include random independent evaluation of videotaped patient encounters, supplemented by review of treatment decisions made of lesions and rashes based on photographs or on “secret shoppers.” All the really serious means to document and assure quality would be far more heinous than anything being considered now. Threats of physicians won't dispel the truth about MOC: it is corrupt to the core. It has harmed physicians. It threatens their right to work on the basis of metric that does nothing to improve the quality or safety of patient care. Dr. Feldman asks for a viable alternative to MOC. Really, the answer is very simple. ... just as the AMA House of Delegates voted to do so almost three years ago.